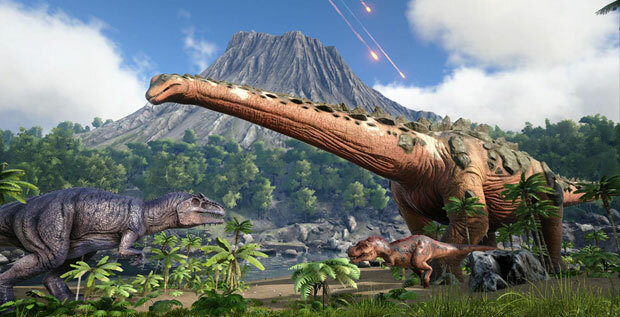 Here are some useful beginner and advanced tips for Ark: Survival Evolved. Use Engrams - Don't forget to use your Engrams early on. When you level up, not only do you get to raise stats in your inventory, you can also select new engrams (blueprints) to unlock. Loading Game - If you would like to continue your single player character, simply start Single Player like you did before. It will load your previous save. Your progress is saved per map. New Character Start Tips - Right after you spawn, you should scan for hostile dinosaurs then start picking up rocks, punching trees for wood and thatch until you have enough for a pickaxe. Make sure you stop hitting trees with your bare fists as soon as you can craft a pick, as you take damage and can bleed out otherwise. After building a pickaxe, you should unequip whatever is in your hands and walk around foliage hitting your use key to pick up fiber, and berries. You can eat berries until you starting hunting dinosaurs for meat. You can also go fishing, but be aware of piranhas, sharks and other dangerous creatures. Try to stay around the beach area, as there will be less hostile enemies there, and you can also drink water to hydrate yourself. Hatchet vs Pickaxe - Hatchets get less thatch than pickaxes from trees, so craft one as soon as you can if you need more wood. Hunting Dinosaurs for Meat - As soon as you can find some easy to kill Dinosaurs and hunt them for their meat. Once you defeat a dinosaur, keep slashing at it to get meat and hides. Be careful hunting dinosaurs in packs. Some may me small, but in numbers you won't stand a chance. Crafting a bed - You should craft a bed as soon as possible so you have a place you can spawn from in case you die. The Hide Sleeping Bag is one time use, but it's better than nothing. Later on you can learn the engram for a Simple Bed, which has unlimited uses. Note that the Simple Bed, while having unlimited uses, has a 5 minute cooldown on when it can be used. So if you die right after a previous death, wait a little to be able to spawn again. As soon as you can, build a storage box next to your bed, and store some spears, and other weapons inside. This will be very useful if you die near some dangerous enemies and need to get back to your items. You will have to defeat those enemies to get your stuff back! Keep in mind sometimes, you can find your body and all your items even if you die multiple times trying to get back to it! So don't give up. Night time danger - Be very careful during the night its a lot easier for enemies to sneak up on you. Carry a torch and try to use high ground (like large rocks) to hide and to scout the area ahead before venturing further. Conserve your energy - The more you run, the more food you use. Your food meter goes down quickly when your stamina recovers. So try to not run as often until you have a good food source. Try to save your stamina if you need to run away from an enemy instead. Semi-Safe zones early on - I've found if you stay near the large passive dinosaurs (like a Brontosaurus), other aggressive dinosaurs are less likely to attack you. It's a good way to farm materials without worrying about being attacked before exploring further into hostile areas. Healing broken bones - Make sure your Health recovers past a certain point to heal broken bones. Keep warm, hydrated and fed, because once your HP recovers your bones will heal. Flying enemies - If you are chased by flying dinosaurs, try going underwater to lose them. Sometimes they may go after fish instead and you can safely leave the water and run away. But please be aware that there may be other aggressive enemies underwater as well. Jumping further - If you do a running start by sprinting first, you can jump a bit higher and further, allowing you to climb further as well. Beware of heights - Be careful near cliffs and other high areas, one wrong step or jump and you could fall to your death or break some bones and then bleed out. Fall damage in this game is a lot higher than most other survival games. See better at night - You can drop a torch on the ground with right click to see what you're working on better or to help you fight enemies at night. Eventually you can also craft standing torches for even more vision at night. Getting away from danger - If a dangerous dinosaur is chasing you, try leading them to other dinosaurs. Sometimes they will simply start attacking that dinosaur giving you a chance to escape!